← NEW Summer Pepsi — Caribbean Gold! Yukata. Festivals. Fireflies. かき氷 (kakigori) or shave ice. Sweat trickling down your back as your fan gently pushes the humid air past your face. All of these things mean summer in Japan, and one thing rises quite literally above the rest–fireworks. 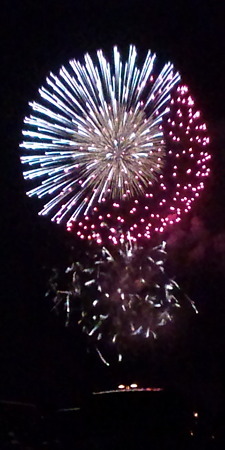 Of course, everyone’s seen the fancy shaped fireworks that have been all the rage recently–hearts, smiley faces. Some are more successful than others, exploding perfectly and right side up, unlike their lopsided, misshapen, topsy-turvy brothers. In Japan of course we have some that I’d never seen before–Hello Kitty and Doraemon light up the night sky on summer evenings. And tonight, at the Nagaoka festival in Niigata, a new shape appeared that’s been lighting up Twitter ever since–the Pokéball. Captured (gotta catch’em all!) by ひろ on Twitter. What do you think? Does it look like a giant Pikachu should be jumping out of it to battle the wild Seaking who just appeared? Charmander used burning ash attack, it’s super effective! This entry was posted in Japan, you so crazy! and tagged ポケモン, 花火, fireworks, hanabi, I heard you like mudkips, pokeball, Pokemon, silly. Bookmark the permalink. 3 Responses to Pokéball Fireworks! “It’s super effective.” Haha! My brother and I still randomly say that after years of playing Pokemon on the ol’ black n white Gameboy. First time reader and commentor. I’m slightly obsessed with most things Japan, so I like what I see so far!